Here we come with some details about a special offer which is now available at U.S. Coach stores and online. Spend up to $250 and take 20% off your purchase. Spend between $250 and $500 and take 25% off your purchase. Spend up to $500 or more and take 30% off your purchase. 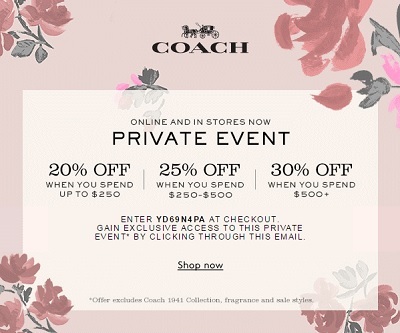 To receive the offer use your private code which you can get through Coach emailing. Source of the information is Coach. Offer is valid until March 19, 2017. More details available at any U.S. Coach store or Coach online.